The North Central Province of Sri Lanka is a sparsely-populated region, mostly covered in dry tropical woodlands. Just north of the Hill Country, the area is home to a number of ancient cities and sites known to travellers as the Cultural Triangle. The northwestern point in the triangle is the city of Anuradhapura, a UNESCO World Heritage Site famous for its well-preserved ruins, including the ancient Lankan civilization dating back to the 10th century BC. Anuradhapura was the capital of Sri Lanka until the 11th century, and is considered sacred by Buddhists; the city is surrounded by monasteries that cover an area of over 16 square miles (40 sq km). To the northwest is the city of Polonnaruwa, which in modern times has grown into an important transport hub on the road between Colombo and Batticaloa. 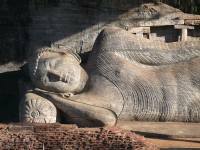 Tourists travel to Polonnaruwa for its convenient location near several national parks, and its amazing archaeological relics. Polonnaruwa is also home to the remains of an ancient capital, and the ruins of the fabulous garden-city were declared a World Heritage Site in 1982. Polonnaruwa's new town is less fascinating, but there are a few hotels, shops and restaurants that have sprung up to cater for tourists. The third major city in Sri Lanka's Cultural Triangle is Dambulla, famous for its cave temples: sacred sites housing dozens of ancient statues of the Buddha. Dambulla is located near the towns of Kandy and Sigiriya, which are also places worth visiting in the North Central Province: Sigiriya for its impressive geological formations and Kandy for its relaxed atmosphere and interesting temples and museums. We are looking for contributors for our Cultural Triangle travel guide. If you are a local, a regular traveller to Cultural Triangle or a travel professional with time to contribute and answer occasional forum questions, please contact us.